What Anxiety Remedies Are Available And Is There An Anxiety Remedy That Can Cure You? An anxiety remedy is often the treatment of choice for people who are frightened about the risk of side effects and dependency if prescribed traditional medication. It is normal to experience anxiety in response to a frightening event but when the anxiety becomes overwhelming, it can take over a person’s life. 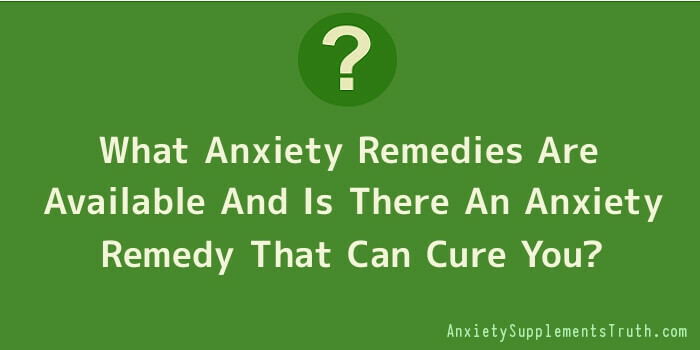 There are numerous anxiety remedies available on the market and some are used commonly. Amongst these are home remedies, herbal remedies and homeopathic remedies. The advantage of using an anxiety remedy is that a person can experiment with different types of products after reading up about them to see what is likely to be more effective. This gives the person a degree of control over their own treatment which isn’t usually possible in traditional medicine. A number of companies research the effectiveness of different herbs and vitamins in clinical trials and develop combinations of the herbs and vitamins to treat different conditions. Many home remedies have been passed down through the generations in families and some can be very effective as an anxiety remedy. A very simple anxiety remedy is the smell of an orange after it has been peeled. Placing a small piece of orange peel to simmer in a small pan of water or in a pot burner can be just as effective. Another home remedy is to soak in a warm bath containing a third of a cup each of ginger and baking soda for 15 minutes. One anxiety remedy produced in this way is Seredyn. This product contains the amino acid L-Theanine which is thought to increase levels of GABA, one of the brain neurotransmitters which are depleted when someone is anxious. Seredyn also contains Passion Flower and Valerian, together with small quantities of Niacinamide and Magnesium Taurinate. Valerian is an age-old anxiety remedy thought to interact with another neurotransmitter called adenosine to reduce levels of anxiety. Another anxiety remedy known as Relora is composed of the following plant extracts: Magnolia officinalis and Phellodenron amurense. Numerous studies have shown that levels of the stress hormones Cortisol and DHEA (Dehydroepiandrosterone) are reduced in people suffering mild to moderate anxiety after taking Relora for two weeks. The anxiety remedy SociaTropin is made up of the following ingredients: St John’s Wort, Panax Ginseng, Valerian, Passion Flower, Rhodiola Rosea, L-Theanine, Sensoril Ashwagandha, 5-HTP, Cyracos Lemon Balm, Ginkgo Biloba, L-Tyrosine and Bacopa, as well as some essential B vitamins. The method of action of this anxiety remedy is thought to be the restriction of excess Cortisol as well as boosting the neurotransmitters in the brain involved with mood and anxiety. These neurotransmitters are GABA, Norepinephrin, Serotonin and Dopamine. A large number of people prefer to use individual plant extracts or vitamins as an anxiety remedy rather than a compound preparation and many are available on the market to choose from. Many people choose a homeopathic remedy as their anxiety remedy of choice. For mild to moderate anxiety it is probably possible for someone to choose a suitable anxiety remedy through trial and error. However, in more complicated cases, it is advisable to seek help from someone trained in homeopathy to choose a suitable anxiety remedy. These remedies are often preferred by people who are very anxious due to their lack of side effects. An anxiety remedy that is gaining in popularity as more and more people are introduced to it is the Linden Method. Charles Linden is the author of this natural anxiety cure. He suffered for many years from anxiety, depression, agoraphobia and obsessive compulsive disorder and nothing helped to improve his condition. In despair, he decided to take over his own treatment and very quickly improved until he was cured. Mr. Linden has used his experience and knowledge to develop the Linden Method and over the past 12 years it has cured over one hundred thousand people of anxiety. The method aims to reset an area in the brain involved in emotions so that it is no longer on constant high alert but is returned to its pre-anxiety level, thereby removing the sufferers physical symptoms of anxiety permanently and without the possibility of relapse.